The ‘Industry 4.0 needs SMEs’ study particularly highlighted the fact that this future trend absolutely requires the involvement of medium-sized companies, as well as the development of digital skills among specialists and executives.This message was welcomed at the ‘Industry 4.0 in Medium-Sized Companies’ synergy workshop run by the German Federal Ministry for Economic Affairs and Energy (BMWi), where Professor Christoph Igel was invited by the BMWi to present the key findings of the CATI study on 30th June 2015 in Berlin. Professor Christoph Igel (CATI) during his Federal Ministry presentation on the topic of ‘Industry 4.0 needs medium-sized companies’. 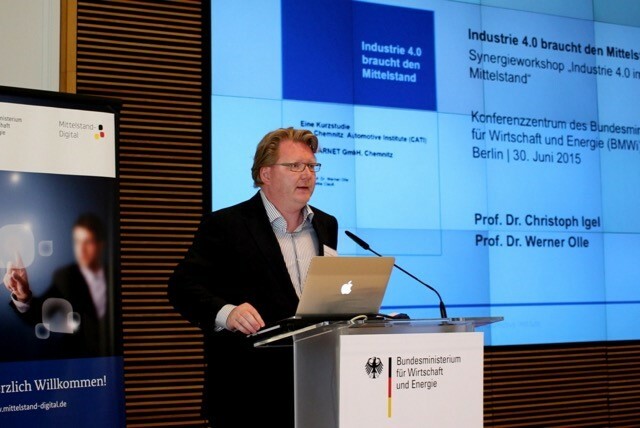 This topic has also prompted an invitation to a workshop organised by the Federation of German Industries (BDI) and the Plattform Industrie 4.0 offices in Berlin in mid-September, whereCATI will again be presenting its findings. 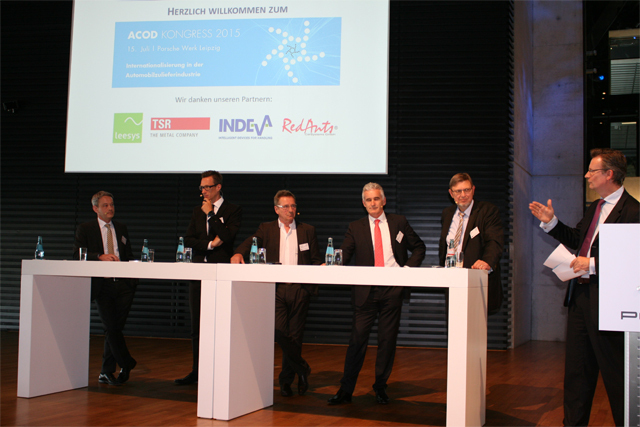 Professor Werner Olle was able to present the particular significance of industry 4.0 for value creation and business processes in the automotive industry at the interact conference 2015 held in May at TU Chemnitz.Excerpts from his presentation have now also been published in ‘Autoland Sachsen’ II/2015. The results of the second focal study on the ‘Internationalisation of the German automotive industry’ was published in the run-up to this year’s Automotive Cluster of East Germany (ACOD) conference, organised in Leipzig in mid-June and focusing on this precise topic.During the concluding panel discussion, Professor Werner Olle (who introduced the findings of the CATI study) was joined by two members of CATI’s Advisory Board in Helmut Weirich (VDA) and Dr. Jens Katzek (ACOD), ensuring that the Chemnitz Automotive Institute had an excellent presence at this forum. The results of the CATI study were also published in the latest issue of ‘Autoland Sachsen’ II/2015 under the title ‘How international is the German automotive industry?’. → How will the VW crisis affect the ‘car state’ of Saxony?